That’s why a modern cartographer needs to be an interdisciplinary professional. For a cartographer, it is most important to know about computer sciences, as well as GIS, photogrammetry, remote sensing, geodesy, design, art, modelling, and analysis techniques. A cartographer must be able to adopt new technologies. The challenge cartography faces: while maps are more prominent than ever, cartography is losing ground in institutions. Those who have been involved in cartography for a while have witnessed transitions not only in what we do and how we do it but also especially how we talk about it. Instead of talking about cartography, we use terms such as GIS, geomatics, geoinformation science, geovisualisation, visual analytics, and geospatial information management—to name just a few. Those terms have a short history that dates to the adoption of computers for making maps. Maybe you have experienced difficulty in describing a “geo-spatial-visual something,” but maps and cartography are universal terms that everyone recognizes. Isn’t a new name needed that reflects these changed competences and technologies? Shouldn’t this name indicate I am doing something modern, complex, and contemporary that will be respected, appreciated, and recognized? If I am to call myself a cartographer or say I am involved in cartography, will I receive the same respect, appreciation, and recognition, or will I be associated with something old-fashioned and outdated? There are many rationales for the use of certain terms, and all have relevance. However, it seems that the term cartography is avoided, especially by cartographers. 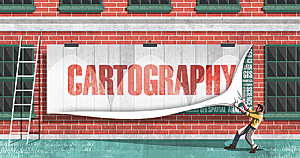 Many activities now associated with other terms could easily simply be called cartography.